I started this book in 2014 soon after it came out. Maybe it was the month it was published or maybe it wasn't. I read it to about halfway and then I set it it aside. I knew I'd come back to it eventually, though. Now it's June of 2015 and I can finally say that I completed it. This is the third book I have completed this year. It's not quite up to the "60 book a year" mark I had set for myself back in 2009. With each year I've been reading less and less. Too much internet and anime, really. I know my weaknesses. This is the first Stephen King book I've finished since 11/22/63. I've got the others he has released since then including Finders Keepers but I just haven't gotten to them. My re-read of The Shining is also somewhat on hold. But I'm proud of myself for completing this one even though it isn't the greatest King book I've ever read. This isn't a transcendent journey like 11/22/63 or even Lisey's Story (which I didn't really enjoy as much as I would have liked - I mostly read it because I want to read all of King's work), but it did have that signature King feel. 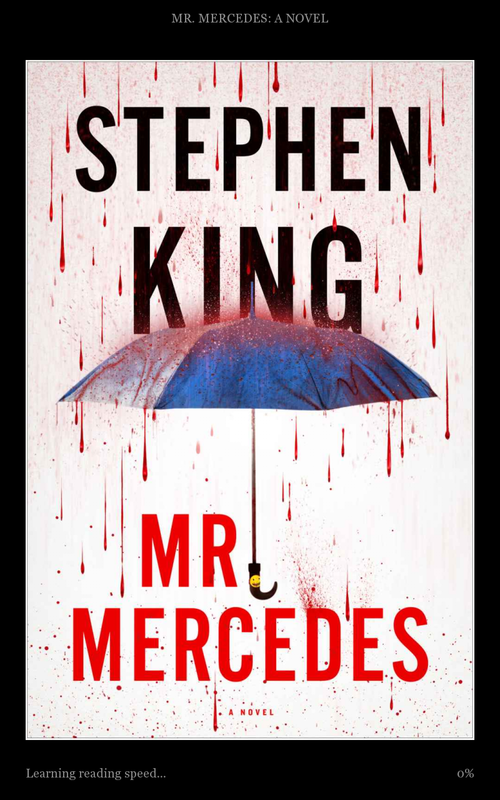 Mr. Mercedes is a down to earth novel that isn't supernatural at all. And King has done that before with varying degrees of success. Cujo, comes to mind. Misery and Rage and even The Running Man as well. This isn't horror, either. Not that that's a complaint even though some have made it out to be. I loved The Eyes of the Dragon even though that wasn't horror at all. 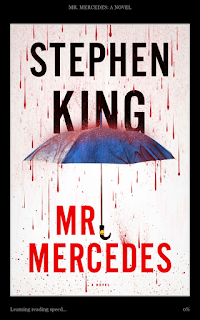 So on what level does Mr. Mercedes reside in the great tower of Stephen King releases? Hmmm... Well, it really isn't all that original. It doesn't try to remake the wheel or put any new treads on it. While I was reading it I thought of great cat-and-mouse novels like Red Dragon. Well, Red Dragon this is not, but it is good because it is written by an author that can make just about any story interesting. Kermit William Hodges has a silly name that would make even Dean Koontz proud, but he's a fairly likeable character. Maybe not the best lead King has ever written (that would probably be Roland Deschain of Gilead), but Hodges is serviceable. He's haunted by the crime committed by Mr. Mercedes and toys with the idea of suicide. Until he is sent an invitation to get back in the game from the "perk" himself. The kid who mows his lawn is Jerome Robinson and Jerome has this annoying thing where he talks with an affected ebonic accent, but other than that Jerome is alright. Together with Hodges, the two of them make an unlikely duo as they take on Mr. Mercedes. They aren't exactly Riggs and Murtaugh, but there's a chemistry there. I just wish that King would have had Jerome would lay off on the Tyrone Feelgood Delight thing. Just using it once would have been more than enough. It makes the characters uncomfortable, but it made me a bit uncomfortable, too. Maybe all of that recent confederate flag controversy has gotten to me, but it seems having a black character put himself down that way is a bit untimely. Of course, there have to be a few chapters written from the viewpoint of the bad guy with these types of stories and in some ways those are the best ones. Brady Hartsfield is one messed up dude and King is great at creating messed up dudes. He's been doing it for years. It's what I feel he can do best and it works just fine outside of a horror setting. In fact, it's through this gateway that he can successfully go from the realms of horror to the realms of crime. It might be a bit gratuitous to you, but I've read plenty of Laymon and Lee and this feels like coming home to me. It's certainly within the confines of what I can read on a full stomach. But at times I felt like I was reading a Dean Koontz story, too. Not the words themselves, but a Dean Koontz story nonetheless. You know, back when Dean wrote thrillers that were pretty good and fast paced, but a bit generic, too. If only Hodges had owned a dog... Still, Stephen King wrote a really good novel with this one. He's not quite Donald E. Westlake, though. This isn't quite the hardboiled crime caper I thought it was going to be. Maybe if it had been a Richard Bachman novel it would have been. I'll certainly pick up Finders Keepers. I believe I set this book down the first time so I could wait for Finders Keepers to be released, anyway. I just view this book as a middle of the road Stephen King novel. It's better than others (not many), but it isn't a classic. It could have been better. The opening was certainly memorable, though. And there was one character death that was incredibly impactful. Yet I still think it could have been better. I'm with you, good not great. I liked Finders Keepers a little better but just a little bit. But when you get to the end of Finders Keepers, you will see that SK has set up a potential fantastic volume 3. I hope he delivers. If volume 3 turns out to be great, it will probably elevate the other two novels in my mind. Hope you get those account issues figured out, Joe. It's weird - I'm actually logged in on google but I can't select my account in the drop down menu of the comments, like I'm not logged in. I'll go try logging out and then logging back in. Ok, I finally figured it out. I have two google accounts. I got a new phone a while back and created a separate account for my phone e-mail and I was logged in with that instead of my old one. I shouldn't be anonymous any more. Awesome. I've got two google accounts, too. One of them is for my adsense account and the other is obviously for this blog. But I had to manually make my other google account an admin here so I could use that account for adsense. My current account is associated with a now defunct url so I had to create that second one to use for this url. Just an experiment I'm trying for now.